From the M1 South, go around the city on to the M2 EastTake the Joe Slovo off ramp. Take Market Street off ramp to your rightKeep right, and go over one set of lights. At the next set of lights go right into Betty Street. Take Next right into Fox. Main Street Life will appear on your left. The Bioscope is on the ground floor. 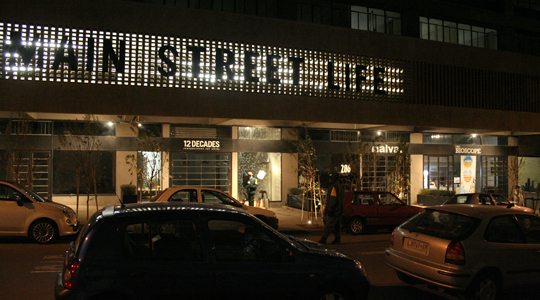 The Bioscope is located in the Maboneng Precinct. There is guarded street parking located directly outside the cinema. There is also a precinct wide security solution and Jeppe Police Station just around the corner, so you are more than safe! When a mysterious gangster starts sabotaging soccer team The Eagles’ chance at winning the upcoming championship final, there is only one man who can save the day…Joe Bullet. After a well-executed jewellery store heist, two amateur thugs go on the run. But the police are not too far behind, and after a chase through the countryside, the thugs are apprehended – but only after they stash their loot in a clump of nearby bushes. When two best friends head off into the wilderness on a camping expedition together, luck seems to be on their side when they discover the hidden stash of diamonds. But life is never that easy, and the two thugs, after a daring escape from prison, pick up the trail of the friends, hunting them down in order to reclaim their loot. In the end, the boys’ parents come to their rescue, and the two dim-witted criminals are sent back to jail once more – hopefully for good this time! When Kay Kay, a powerful, ruthless businessman sets out on a mission of revenge against two men accused of killing his brother, he strong-arms the local sheriff into forming a posse of thugs to aid in his vendetta. But when Jet and Owen, the two easy going friends, learn of the gang out for their blood, they prepare to stand their ground and fight back. It all comes to a head in a final gun-fight, a showdown in the small western town where blood will have to be spilt if the friends wish to come out of this alive. The original feature film produced in 1975, based on the books by Topsy Smith that ultimately led to the renowned and well-loved television show, introduces Trompie as a freckle-faced eleven year old boy, and the Big Chief of the Boksom Gang. Together with his mates Rooie, Blikkies and little Dawie, the young boys embark on a series of mischievous adventures that often land them in hot soup with the townsfolk of their hometown of Kwaggaberg. Their cajoling with the Reverend’s pet baboon gets completely out of hand and Trompie’s innocent attempts at fixing his sister, Anna, up with a boyfriend goes terribly wrong. Not only does Trompie and his gang of friends almost ruin the annual school concert, but their shenanigans leads to a bet that Trompie will be able to crash the show and appear on stage that evening. Throughout all these misadventures, Trompie befriends a playful mongrel who belongs to an old man about to leave the town. As the story comes to a close, Trompie will have to watch on as the mangy dog has to choose between staying with the impish young boy or leaving with it’s old master.